I have a Asus x53e laptop. For two months, the power fails while running, and it shuts down without warning. I have changed windows but the problem persists. I have opened my laptop and had service done, but no result. The battery holds a 100% charge at the end of charging. After 45 min, anytime the power fails with no warning. It sounds like your Power Options settings are not where you may want them to be. Try going to: Control Panel\Hardware and Sound\Power Options\Edit Plan Settings and click the "Change advanced power options" button. 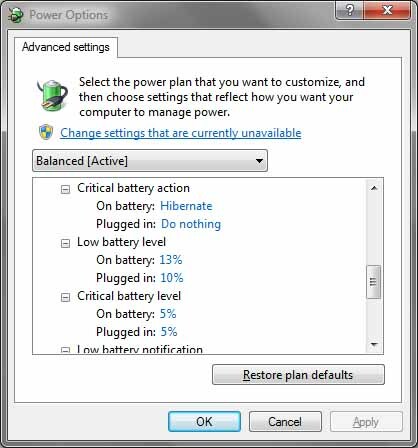 Then expand the "Battery" item and verify your various settings there. If you have already done that, then add that to your post. Your percentages may be off. Which model number? There are many x53e laptops by Asus. In general, whether or not the battery says it has a full charge, it can be bad, or out of calibration. To find how long your battery runs, charge up the laptop, set it on a table or counter, and run a small script like this from a command prompt. dir /s | find "total"
This will loop around and add the current time each time it runs to a file named ran.txt - and when the laptop shuts down for lack of battery, then recharge the laptop, reboot, and compare the time at the top of ran.txt to the time at the end of ran.txt for the time your battery runs on what it thinks is a full charge. The run-until-shutdown then full-recharge-before-power-up can recalibrate the battery's charging controller. When it is fully charged, collect the start and end times, and then repeat the process to see if the charge cycle improved. If it's still less than an hour, it's new battery time, for product reviews of the low end i3 version of this laptop indicate a runtime of 3-4 hours. Not the answer you're looking for? Browse other questions tagged windows-7 laptop battery asus-laptop or ask your own question.